The first step in building a profitable sales process is to decide where to focus the prospecting efforts of your sales team. Too many sales people (and their sales managers) take an undisciplined approach to defining their ideal targets. As a result reactively pursue whichever opportunities land in their sights (whether or not they are the right opportunities) rather than proactively focusing on the right opportunities (situations that drive profitable revenue). How many of your sales people focus on the wrong opportunities simply because that's what they can easily pursue? 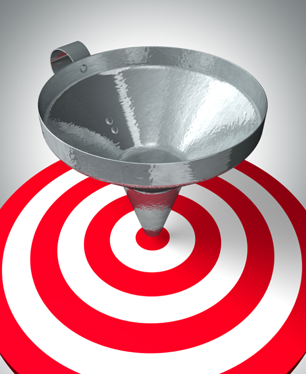 When your sales leaders bring focus and discipline to the proactive prospecting efforts of everyone on your sales team, you'll see a dramatic improvement in their prospecting efficiency and the profitability of the opportunities that enter your sales funnel. So what can you do about it? Last week we wrote about the 10 Steps to Building a Profitable Sales Process. The first step is to know your target and here's where you can get our Free Sales Focus Worksheet, a tool your sales leaders can use to facilitate an exercise that will help clarify and focus your sales team's thinking about which opportunities to prioritize and pursue. Know exactly who your most profitable customers are, what makes them profitable, and precisely how you started the relationship. Not all customers are created equally. You probably have some customers who don't quite fit your model but they still buy from you and generate revenue. That's fine since you already have them, but if you can choose where to focus your team why not target the "ideal customers?" Who are the customers that are an ideal fit for your model and support where you want to go as a company? These are the customers to focus on for this exercise. Know the prospective customers in your market that are similar to your most profitable customers and build a list of every person inside those companies that could have (and truly care about) the problems your product or service can address. Sometimes it takes three to five conversations to figure out who really cares about the problems you address. Start with the titles and areas of responsibility most like the titles and areas of responsibilities of your most proftitable customers and make sure your sales team is ready to shift their focus as they learn more about the target company. Know your target customers in the true sense of the word - what is important to them, what worries them, what pressures do they face, what does "success" look like to them, what situations create an opportunity to engage them, what do they read, what LinkedIn groups do they join, and so on. Really know who they are, what is important to them, and how you might be able to help them if they have the problems your product or service can address. Dave Kurlan writes about the concept of "positioning statements" in his book Baseline Selling. Sometimes sales people will just call to their comfort level. If they are "comfortable" calling purchasing agents but the purchasing agents your sales people are calling don't care enough about the problems you solve, what good does it do to spend valueable time calling them? Find out who does care and start calling them. Maybe it's the engineering manager but your sales people don't like calling that title because they are difficult to reach and a bit prickly when they finally connect. Make sure your sales people push the boundaries of their comfort zone by calling the person who cares about the problem (and not just the person they are comfortable calling). How do you know? Have them make (and then have your sales manager inspect) a top X list of target accounts. The number of accounts to target will vary based on a number of factors (length of your sales cycle, complexity of the sale, experience of the sales person, etc.). Generally it will range from somewhere between 10 and 50 specific targets. That is a specific person at a specific company you believe can become a profitable customer. Our next article in this series will take a tactical look at building these lists. Do you want to have a notify next time a blog will be published. Subscribe to this blog by entering your email address on the right hand side. and then....everything grinds to a halt. 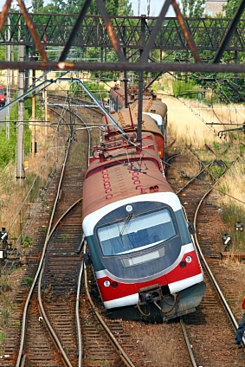 The sales train comes right off the tracks. Calls are not returned. E-mails are ignored. Prospective clients seem to disappear into thin air. What happened? And more importantly to the executives and owners I talk to about longer sales cycles, what can you do about it? Here are four ideas you can implement today that will dramatically shorten your sales cycle, sustain sales momentum, increase revenue, keep your sales team focused, improve feedback from prospects so your team understands how prospects are engaging when prospects disappear, and keey sales conversations on track. This is something every sales person on your team can do. Have your sales people set expectations at the beginning of the meeting to clearly define the purpose of the meeting and what they want to accomplish by the end of the conversation. This simple step keeps everyone on the same page, sets a goal and expected outcome, and idenfities any potential misalignments. All in the very first 5 minutes of the meeting. A strong agreement at the beginning of a meeting sets a clear agenda for the call and will seperate your sales people from everyone else calling on that prospect. This is also something every sales person on your team can do. No matter how the meeting ends there should be a clear next step. Let's say the meeting is dreadful and there is no potential for future business. An appropriate step might be taking that prospect off your list. Let's say the meeting was good, but the timing is not right. A great next step is to ask the prospect "could I call you in 3 months" or whatever the appropriate timeframe might be. And when it's a great meeting wher the timing is right and the conversation should move forward? A great next step will summarize the key points agreed upon, define the next steps each person needs to complete, set a timeframe as well as the next meeting or phone call. Actually scheduling it right on the spot will greatly increase the momentum and keep things on track. At every stage of the sales process a common next step is to send additional information (design specifications, product information or brochures, case studies, testimonial videos, and more). Rather than just e-mailing it and hoping they read it, we have been using Postwire to create pages for prospects where they can go to one place to view all of the relevant information to the sales conversation. The presentation is much better, you can include videos and other media, and you can track whether they open the information, when they open, whether they forward it to someone else in their company and much more. This creates a better client experience and will help your company and your sales people appear far more professional than just sending an e-mail with a bunch of attachments. Bring greater consistency to the sales communication process using this great little application. Instead of each sales person on your team reinventing the wheel every time they need to send a follow up e-mail, break down the wall between sales and marketing and have them work together to create common templates that apply to each stage of the sales process. Not only will this save time for your sales people, it also helps them be more timely in their follow up. For example, you can set an alert so when the prospect opens the e-mail your sales person can call them right then and ask "did you get that e-mail I sent to you?" Time kills deals and if your competition has this kind of insight and your sales people are just following up whenever they get to it, who do you think is going to win the business? How long is your sales cycle? Could it be shorter? What would your business look like if it were? Are your sales managers capable of coaching your team to set strong agreements at the beginning and end of each sales meeting they go to? Need answers? Ask for a free overview of our newest tool - the Sales Effectiveness and Improvement Analysis™ - and we will follow up with you to find out if it makes sense to talk about helping your sales organization become more effective. 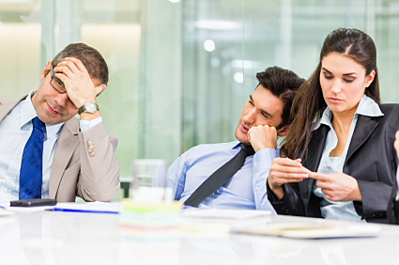 Are Your Boring Sales Meetings Driving Growth and Change? How effective are your sales managers at running a good sales meeting? How engaged are your top performing sales people? How much is this costing you in terms of lost productivity, lower morale, and higher turnover on your sales team? Here’s a quick test you can do by sitting in their next sales meeting. Put aside the fact that your being there may change everyone’s behavior. Just ask one of your sales managers if it would be alright to sit in for a few meetings just as an observer. Here’s what I want you to observe: count the ratio between statements your sales manager makes and questions your sales manager asks. You might be surprised by the results! Too often the sales meetings we observe tend to focus on unimportant administrative tasks and boring progress status reviews. Too often we hear statements, proclamations, and updates instead of questions, discussions and collaboration. That's why most your top producing sales people dread going to sales meetings and will find just about any excuse to be somewhere else. What would happen if all of the administrative updates happened offline before the weekly sales meeting? What would happen if every week your sales managers spent no more than 15-20 minutes on updates and then focused the balance of the hour on a particular sales challenge or market opportunity? Would your sales people make incremental progress if every week they spent 40-45 minutes collaborating with their teammates in engaging discussions facilitated by your sales managers? Prospecting Focus - ask your sales managers to go beyond a quick review of the top 20 prospects each sales person is targeting. Instead they should facilitate a conversation about why they picked those prospects, how they're approaching them, what they say when they get them on the phone, which questions and examples create the most urgency to schedule a meeting, what activity levels are driving success across the team, and so on. Everyone on the team should walk out with clear next steps and expectations to meet and report on at the next sales meeting. Overcoming Objections - have your sales managers facilitate a brainstorming session to identify the most common objections (price is always number one) the sales team encounters. Rarely will the list go beyond 12-15 total objections. Work through the top two to three (2-3) objections as a group and then assign the rest and have each sales person outline strategies to overcome/address/handle/neutralize the objection assigned to them and present it at the next sales meeting. c) where they would focus their time and efforts or who they would call if they were the sales person (prospecting and referral opportunity). Each sales person should share their findings with the team and your sales manager should facilitate a discussion around what this feedback means and how to use it on upcoming sales calls. Question Funnel Exercise - what are the six to eight (6-8) most common problems or challenges your customers and prospective customers face? Ask your sales manager to facilitate a discussion and brainstorming session to document ALL of the questions a sales person could ask to uncover these common problems and challenges. What questions and discussions will expose these issues? What are the different question sets that will help a prospective customer "discover" the impact these challenges are having on their business. Market Trends - what changes are happening in the markets you serve that could impact your prospective client's ability or urgency to buy your product or service? Is the competitive landscape changing? Is there a new technology or business model that could disrupt your business? Are there regulatory pressures? Are there capital challenges or financing requirements that could delay a project start up? What are your sales people hearing in the market that everyone should know about? Can your sales manager facilitate a discussion that helps everyone on the team drive that discussion on sales calls rather than react to it cold? Win/Loss Analysis - have your sales manager select a recent deal (either a win or a loss) and go deep into what happened. What went really well that should be repeated whenever possible? What didn't go so well that should be avoided in future opportunities? How repeatable and avoidable are these factors? What are the specific activities, behaviors, and deal components that a sales person can control and drive in future deals? Are your sales managers strong enough to go beyond the celebratory "high five" for wins or the surface-level "post mortem" for losses? What lessons should every sales person on the team learn from each big win or loss? If your sales meetings have become a boring exchange of updates and progress reports, why not have your sales managers jump start them with any of these topics, or whatever issue is most pressing at your company? If they run out of ideas, simply have them ask everyone on their sales team to write down their top three _______ (sales challenges, sales successes, obstacles, growth opportunities, process improvement ideas, referral strategies, closing questions, and on and on) and then faciliate a discussion about that. Contact me and ask about how we can help increase the focus for a series of sales meetings. The difference between top producing sales people and everyone else is their ability to hold themselves accountable on a consistent basis. Our simple, four-step Sales Accountability Plan will help you do just that. Does Your Sales Team Have Consultative Selling Skills? Our last article discussed how sales has changed over the past few years, why selling is so much harder, and why taking a consultative sales approach is crucial to consistently winning more business. "Does your sales team have the consultative selling skills needed to drive revenue growth and win more business and more profitable business?" Here are five questions to consider as you help your sales leaders drive the transition from transactional sales tactics to consultative sales success. And even if your sales managers have already successfully lead this transition, continue focusing on these questions to reinforce the progress your sales team has made. Do your sales people ask good questions? Too often sales people stay in their comfort zone and avoid asking questions that lead them to an area they may not know. And sales people desperately want to avoid unfamiliar ground so they stay safe by asking easy, surface-level questions. If you have taken steps to map out your sales process and understand the most common business issues and challenges your prospective customers face (from their perspective, not your perspective), you are on the right track. Use your next sales meeting to brainstorm the top three most common business problems your product and service addresses, then develop question funnels that can help your prospects discover and quantify these areas for themselves. Do your sales people ask enough questions? I'm always amazed by how quickly sales people want to move on to another topic. When practicing a sales call or observing a sales rep in action, I can never understand why they are in such a rush! Just when they find something to dig into, they move right past it to the next issue. - Tell your team to really slow down, take their time, and dig deep. - Ask follow up questions. - Ask questions about the problem. - Ask questions around the problem. 1. How long has it been an issue? 2. When did you first notice this? (your operations, your budget, your team, your market position, new product development, recruitment, etc.)? 4. What have you done about it so far? 5. How did that work? 6. How much did that cost? 7. What do you think you'll do next? 8. What happens if this isn't fixed? 9. What does that mean for you? And on, and on, and on. You can always ask more questions, and the more questions you ask that help the prospect consider their business challenges from a different perspective, the more valuable your conversations will be and they will want you to stick around. Are your sales people creating urgency for the prospect to take action? Asking good questions and asking lots of questions will only take your sales people so far - are the questions they are asking creating urgency for the prospect to act? Are they helping the prospect discover their problems, think about them differently, quantify the impact, and want to do something about it (whether or not that means doing something with you). When your sales team starts asking questions that create urgency, the opportunities in your sales pipeline will begin to move more quickly and the deals they close should be at higher margins. Are your sales people effective listeners? It is nearly impossible to keep a consultative sales conversation on track without being a really good listener. Your sales people need to decide to listen, block everything else out, focus in on the most important issues the prospect shares, and ask follow up questions with ease. When your team can let go of the need to control the conversation and just listen, respond, and ask a follow up question, you'll know they're track to becoming consultative sales professionals. Do your sales people quickly develop relationships? How well do they know their prospective customers? Can they quickly build trust and is it genuine? Without a foundation of trust a great relationship, it is nearly impossible to dig into all of the issues they need to explore and ask all the tough questions they need to ask. The sales person who builds rapport quickly, asks great questions that makes the prospect think about their business differently, and adds value by summarizing the challenges and offering new ideas or approaches will quickly develop relationships and will be able to ask enough questions. In this economic environment it's crucial to master the art of consultative selling. Challenge your sales managers to focus on these five questions with their sales teams and hold them accountable to follow through and reinforce these concepts. The sooner you establish that you will no longer tolerate mediocre margins and transactional selling, the faster you will see your revenue picture improve. The difference between top producing sales people and everyone else is their ability to focus their time, energy, and sales efforts on their best prospect and client opportunities on a consistent basis. Our simple Sales Focus Worksheet will help you do just that. Is Selling More Difficult Today? If you’re like many of the CEOs, Business Owners and Presidents we work with, one of your key frustrations is trying to understand why it’s so much harder for your sales team to drive consistent, predictable, sustainable revenue growth. 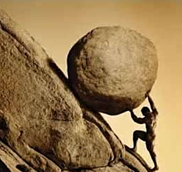 Like Sisyphus, just when you think you have your sales organization under control, things fall apart and you are back at the bottom of the hill. 2. Why is selling so much more difficult today? The people you want to sell to have much more information and it’s easier to get. The level of pricing transparency and product information available means potential clients have much better intelligence. Just a few years ago potential buyers often agreed to see sales people from several different companies and then used these meetings to gather information and gain different perspectives on the market as well as your product or service. Now that it’s easier to get that information (and it gets easier and easier every quarter) two things have changed for your sales people. 1. First, it’s much more difficult to get appointments because potential buyers don’t need sales people for product and market information as much as they used to. 2. And second, when your sales people actually get an appointment the buyer is much further along in their decision process and is looking for someone who can really understand and help them implement and integrate your product or service into their environment – just showing up and talking about features and benefits will get your sales people tossed out pretty quickly. There’s less money to spend and your potential customers are doing far more due diligence about spending it (how to spend it, where to spend it, why not to spend it). Even while balance sheets look stronger than ever and many companies are sitting on tremendous piles of cash, potential buyers are being much more conservative with how they invest it. And who can blame them? The best hedge against economic and regulatory uncertainty is to maintain higher levels of cash. So every buying decision – particularly new projects and investments – will get greater levels of scrutiny and due diligence than just a few years ago. Your sales people need to take the time to truly understand the business impact your product or service can have and help the buyer discover that benefit by asking more questions, better questions, and questions that cover a broader range of issues. Tired old sales tactics such as pin-down questions – “do you want to order today or next week?” – simply won’t work in this deliberate buying environment. No more showing up and collecting orders. Selling is harder and your sales team needs to master the art of consultative selling. They need to ask more questions, better questions, questions that cover a broader range of issues, and questions that add value to the entire process by helping a potential client think about their business differently. Your sales people need to be flexible thinkers who can adjust, adapt, and truly work with the potential client to drive toward a better understanding of the business issues and challenges (even when they discover business issues and challenges that your product or service cannot address). As a leader what can you do about it? It's time to ask yourself some tough questions. Do you have the right sales people to get your business where you need it to grow? Are your sales people capable of adapting to this more demanding sales environment? Do your sales people have the consultative selling skills required to succeed? If not, where do they fall short and are they change-ready? Are your sales managers focused on the right things to drive consistent growth in this environment? 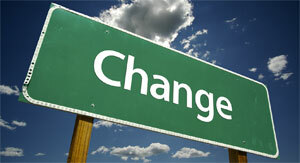 Are they change-ready and capable of leading the transition? If not, where do they fall short and what should you do first to address it? How to Master the art? Until your sales people master the art of selling consultatively as a means of differentiating themselves and articulating your value proposition you will be perceived as a commodity and sales success will often come down to price. Until your sales leaders understand what behaviors and tactics need to change and how to facilitate and lead that transition, your goal of driving consistent, predictable, sustainable revenue growth will remain elusive. "Talking about ourselves...triggers the same sensation of pleasure in the brain as food or money..." It goes on to say "In several tests, (the neuroscientists) offered volunteers money if they chose to answer questions about other people...rather than themselves...Despite the financial incentive...(volunteers) willingly gave up between 17% and 25% of their potential earnings." Ask a sales manager who has been on a joint sales call recently and they'll tell you the test subjects got off easy. When sales people talk about themselves instead of engaging the prospective customer in tough, timely questions they almost certainly give up more than 17% to 25% of their potential earnings! This is one of the most common issues we run into when we work with a sales team. Instead of asking good, tough, timely questions....questions that help the prospect think about their situation in a new way....questions that challenge the way a prospect is doing things currently....questions that reframe the issue and create urgency....questions that highlight the consequences of NOT acting to fix a problem....questions that help your sales person earn respect and credibility....questions that uncover compelling reasons for the prospect to move forward and more importantly to move forward with your company. Instead of doing all of that, what do most sales people do? What do your sales people do? If they're like many of the sales people we meet when we first get started, they probably do exactly what the test volunteers in the Harvard Study did. They talk about themselves. They talk about their product. They talk about the features and benefits of their service. In short, they puke all over themselves and stick to what they know rather than engaging the prospect in a real conversation by asking great questions. What would happen to your revenue growth if your sales people learned a different lesson from this Harvard Study? What if they learned how to ask good, tough, timely questions that got your prospects talking about their problems and challenges? About their strategies and plans? About their company and their job? This study cuts both ways. When your sales team learns to get out of their own way and ask questions that get your prospective customers talking, you'll have more awards to hand out and bigger bonus checks to sign at the end of the year. How many of your sales people are capable of making that transition? 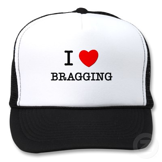 Do you have a sales team or just a group of professional braggarts? How does your sales team measure up? Creating awareness of the gap between "the way it is right now" and "the way it could be" will pull the audience toward you and create more urgency to take action. Establishing a rhythm by traversing between various aspects of "the way it is now" and "the way it could be" creates a more compelling and interesting conversation, building momentum until you end with a new vision for the future. Harnessing the natural resistence we encounter as we ask people to change by tacking back and forth from "what is" to "what could be" and using that natural resistance to actually draw them closer to our vision and idea. The difference between an audience (or a prospect) choosing a mediocre idea (or product/service) over a more clever idea (or product/service) is often simply a matter of how you communicate that idea. Using archetypical examples, personal stories, appropriate emotional examples, and familiar analogies makes it easier for the audience to engage and understand your vision. As you think about the type of conversations your sales team has, how often do they start by spending some time on "the way things are now" and end with a vision for "the way it could be if you used our product/service?" Do they spend enough time asking questions about "the way it is now" and helping the prospect discover the problems and consequences of sticking with the status quo? How effective are your sales people at creating as wide a gap as possible between what is and what could be? What would happen to your sales results and business growth if everyone on your sales team mastered this approach? 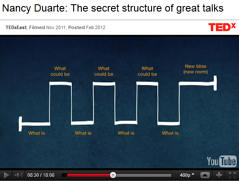 Please enjoy a great presentation from Nancy Duarte on "The Secret Structure of Great Talks." If you would like talking points and a meeting outline with ideas about how to use this at an upcoming sales meeting, please let me know.